You may not always know what records your users want to see. 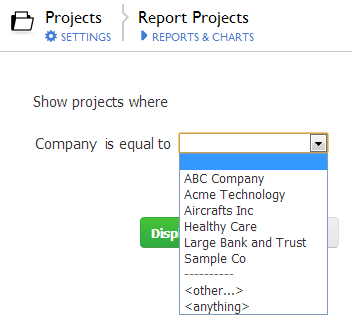 You can create a report that prompts users to enter selection criteria for one or more fields. 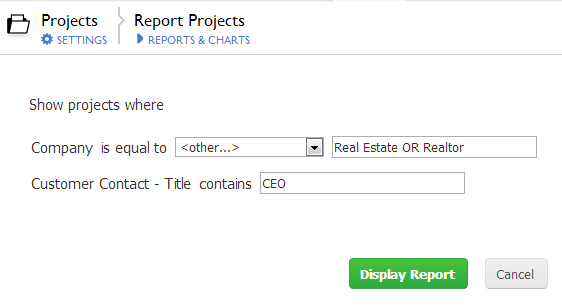 After a user selects the report, Quick Base presents a dialog box like the one shown below. After a user types in a value or makes a selection from a dropdown, Quick Base displays the report you designed, but includes only the records for the user's selection. Any type of report can prompt the user. Create or edit the report you want to prompt users. In the Filters section, select Filter records. Select the field whose value the user will choose. From the dropdown list on the left, select the field you want the user to fill in. In the second column, select an operator. The value you choose here qualifies the value that the user will enter. For example, Date is or Date is on or before are very different qualifiers. In the third column, select the value. Tell Quick Base to ask the user by selecting <ask the user> from the dropdown list. Note: Some field types will not show a dropdown list. In that case, you can type _ask1_ into the text box. A report that prompts the user for information in multiple fields looks like the one show in the following image. If you want to search for any of a few values within a dropdown field, select <other>. In the field that appears, type in each value separated by OR (must be capitalized).